For any of you who are macropod carers or know others who are, who don't yet have a copy of Lynda Staker's definitive manual The Complete Guide to the Care of Macropods, I highly recommend you get your copy. Lynda is viewed as one of the world's foremost specialists of macropod husbandry. WHY IS ACCURATE ADVICE SO CRITICAL IN THE CASE OF MACROPODS? Lynda receives numerous calls from macropod carers all over the world, and the one problem she continually comes across is carers being advised incorrect information, resulting in compromised and ailing (or dying) animals. Most often those who are advising carers do not have an understanding of the specific requirements these unique animals require, and the majority of diseases contracted by macropods in care which could have been prevented with the correct information. Additionally, many carers are locked into methods of management and thought processes from the past, and are afraid to continue to learn, question and change their husbandry practices. As an example, this photo on the right depicts a joey suffering from nutrient deficiency, caused by using the incorrect formula to rear macropod joeys. The most obvious thing, even to a novice, is how the fur is clammy the way it sticks to the skin. Nor does this joey appear to have well developed muscles. However, unless a carer is familiar with the different macropod species and what to look for to identify a species, one would not know what species this is! 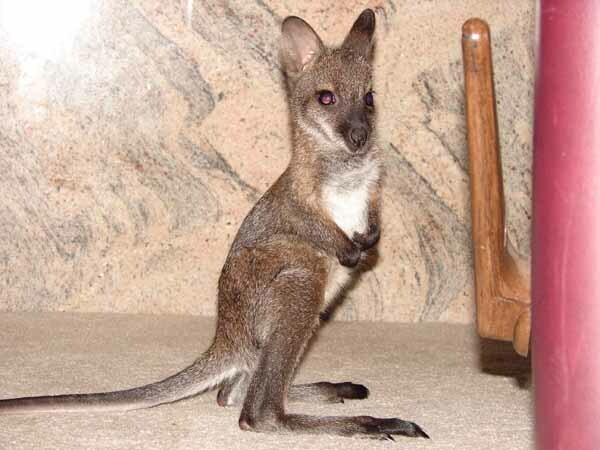 The photo above shows what this joey should look like with the correct nutrition. Notice how soft and healthy looking its fur is, how upright its ears are, how fleshy it looks compared to the joey in the above photo. This second joey exudes health and vitality, compared to the above one which doesn't. Nutrition is everything to a young kangaroo. Lynda's philosophy is that if you don't continue to learn, then it is time to give it away. WHAT IS DIFFERENT ABOUT THIS MANUAL COMPARED TO GENERIC MANUALS? Lynda's manual differs from others because it is the most comprehensive macropod husbandry manual available, and also because the information is precise and to the point. Lynda explains in layman's terms the whys and wherefores of problems commonly experienced with macropod care, which in most cases are based on common sense and an understanding of the physiology of macropods. Lynda is a lecturer and author specialising in the field of macropod husbandry, rehabilitation, and the clinical signs and treatment of disease. While she has reared many Australian fauna species, her forte is predominantly macropods, as they were the most commonly presented to her private wildlife hospital, which she maintained between the years of 1989 to 2003. Professor Rick Speare on macropod disease induced her to begin compiling her own findings, and he became her mentor during that period. Her interest is particularly in the nutritional requirements of macropods, as the ratio of fats, proteins, minerals and vitamins change throughout their development. In 2000, she relocated and began donating her time to educating carer groups with four-day lectures, completing a lecture tour of six Australian States in 2001-2002. In 2002 she spoke at the Macropod Conference in Ohio, U.S.A. and worked in an Australian themed wildlife park in Kentucky in 2003-4 where her responsibilities included designing and erecting new exhibits, creating a veterinary facility for animals in need of treatment, educating animal keepers, designing appropriate diets for the 300 odd animals species, researching information for and creating the Animal Keepers' training manual. To date she has conducted 78 lectures to wildlife carer groups, zoos, veterinarians and wildlife park keepers throughout all the Australian states. Her international credibility is indisputable! WHO IS USING THIS MANUAL? Her previous manual titled Don't Step Backwards is used in nine countries throughout the world. However her latest manual The Complete Guide to The Care of Macropods is now available and is currently used in twenty four countries, including 34 of the States of America. Facilities using this manual include zoos, macropod keepers, universities and veterinary clinics. It has received reviews by both the German and American Association of Zookeepers, the European Association of Zoos and Aquaria and Wildlife Australia. This work is referred to as the macropod carer's 'bible' throughout the world, as it is the only one of its type. This invaluable reference book is 456p, (A4 size) with over 700 colour photos and graphs throughout 30 chapters. Subjects covered range from rescue and handling, emergency first aid, raising methods, identification of species, dealing with problems, requirements, enclosures, diets, release and relocation methods, growth charts, drugs and natural therapies, working with vets, diagnosis and diseases, wounds and injuries, scientific names and status of Australian mammals. This new publication includes information not before published. An extensive section assists veterinarians to deal with many conditions contracted by macropods, and also covers captive care. There is a comprehensive index. The foreword is written by Professor Rick Speare from James Cook University. Without a doubt, the best guide to macropod care on the market. 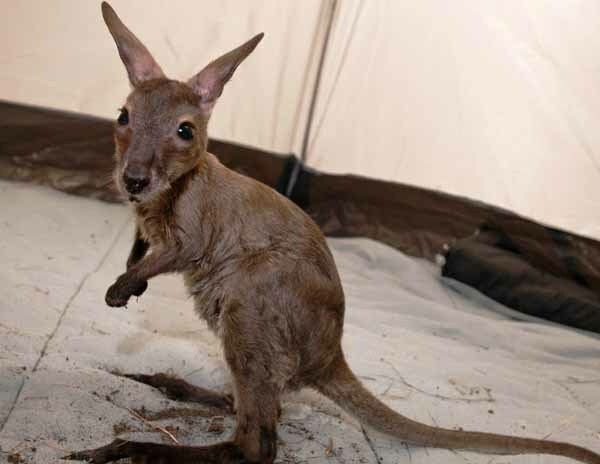 Lynda has been available for advice to macropod keepers on the on-line yahoo wallaby group for the past 10 years and is available for assistance via e-mail macropodology@optusnet.com.au or telephone on (61)07-49551904. ACT Parks and Conservation is this year targeting 3427 kangaroos on six sites in the Canberra Nature Park. It's history repeating itself! The great enemy, kangaroos, have over-bred and now need "managing" in Canberra, our official kangaroo-hating national capital. The irony is that kangaroos are in Canberra's Nature Park, and they are part of Nature! They are part of our national natural heritage, represented on our Coat of Arms, yet their presence is loathed and hated! The "cull" is justified because kangaroo numbers continue to rise despite the Government’s Kangaroo Management Plan culling program. The greenwashing is that kangaroos need to be "managed" to "protect the integrity of ecosystems, several of which contain endangered flora and fauna". Kangaroos evolved with our fauna and flora, and are not their enemy! The hypocrisy is appalling! The integrity of the ecosystem is at danger from man, not native animals. They are felling old growth forests and land continues to be degraded for pasture but the enemy is the kangaroos! They are just scapegoats for the number of cars, human population expansion, feral plants and animals, and livestock. Welcome to Australia, the land of kangaroos!! !